Tutorial about how to send push notification to iOS apps directly using APNS (Apple Push Notification Service). In this tutorial, we will explain about how to send the push notification to iOS apps directly using APNS (Apple Push Notification Service). A few years ago we still using an APNs plugin for send push notification to iOS apps. Now, that's plugin not working with Grails 3. The base 'notnoop.apns' Java plugin also not working for today's APNs HTTP2 protocol. By the way, there's another Java plugin for APNs that support new APNs HTTP2 protocol. It is relayrides/pushy Java APNs library which support Apple's HTTP/2-based APNs protocol and supports both TLS and token-based authentication. It's not the only Java APNs library that supports HTTP2 protocol, but this time when I try this library and it is easy to implement with Grails 3. There are some requirements for this tutorial, please complete it before starting. This time, we are not covering how to create or setup Apple Push Notification Certificate. For that, you can refer to this tutorial. 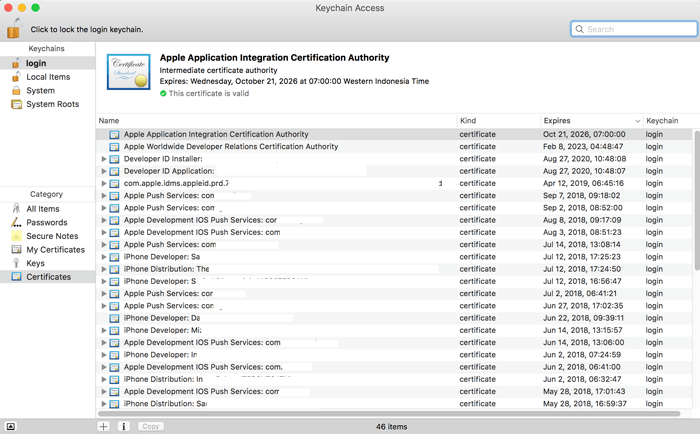 So, we assume you have to get the Apple Push Notification certificate both development and production and exist in Keychain Access app in the OS X. Next, we have to export that certificate as PKCS12 (.p12) file. Open Keychain Access app on OS X. Expand the Apple Push Service certificate that wanna to export then push Ctrl+Mouse button on the Key then choose 'Export'. Save as ".p12" file then give it a password. Remember or write the password on a notepad, because it will use in Grails 3 application. As usual, we always do a tutorial from scratch. That means starting from creating new Grails 3 application. We assume all above requirements already installed and accessible in the terminal or command line. Next, open the terminal or command line then type this command. Go to the newly created Grails 3 project folder. Enter Grails 3 interactive console by type this command. In this interactive console type this command to run the app. You must see this page when open your browser then points to this address 'localhost:8080'. Stop the app by type this command in the Grails 3 interactive console. Back to the point, add required dependencies for sending the push notification to APNs and create a service for using in Grails 3 application. First, add 'com.turo.pushy' Java APNs library as a dependency. To do that, open and edit 'build.gradle' file on the root of Grails 3 project folder then adds this dependency inside dependencies body. Compile the Grails project on Grails interactive console. 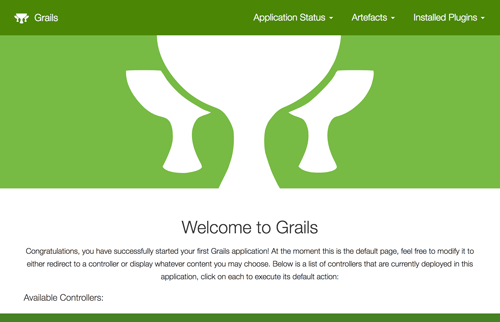 Still, on Grails 3 interactive console, type this command for create new Grails service. Open and edit "grails-app/services/grails3/apns/ApnsService.groovy" file then add this imports. Next, add this method inside the class body. Change "/path/YOURPUSHCERTIFICATE.p12" on the first line of a method to your full path of Apple Push Service certificate file. And also match the second lines of method "ApnsClient.PRODUCTION_APNS_HOST" as the environment that you use (DEVELOPMENT_APNS_HOST = for the development environment). Also, "com.xxxxx" on below line to be your iOS App bundle ID. For test sending push notification, just create new controller and view. On Grails 3 interactive console type this command. Open and edit "grails-app/controllers/grails3/apns/PushNotificationController.groovy" file then replace all codes with this. flash.message = "Push notification sent"
flash.message = "No token or message found"
Now, create file "index.gsp" on the folder "grails-app/views/pushNotification". Replace all HTML tags with this. That it's, now you can run the Grails 3 application then click on the "grails3.apns.PushNotificationController" hyperlink on the bottom of home page. Fill the required fields then click "send" button. If there's no error, you will receive the push notification on your iPhone from Grails 3 server. You can find the full source code on our GitHub.